Singing Stars All Dressed Up! 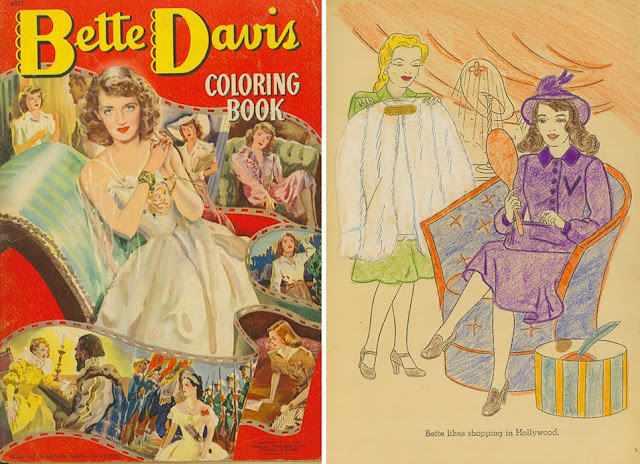 Volume 3 of my on-going series of paper doll books, “David Wolfe’s History of Hollywood Fashions” is now in the final stages of preparation for printing. Singing Stars paper dolls and their costumes celebrate some of the most popular songstresses ready to wear their most fashion-conscious creations. 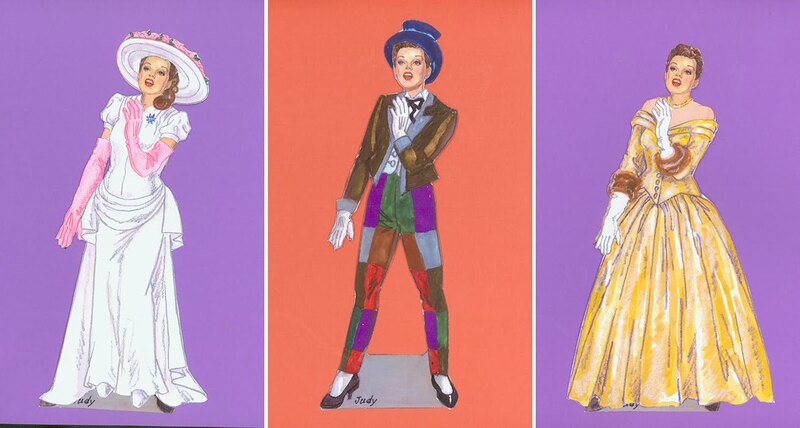 Judy Garland’s wardrobe from A Star is Born. 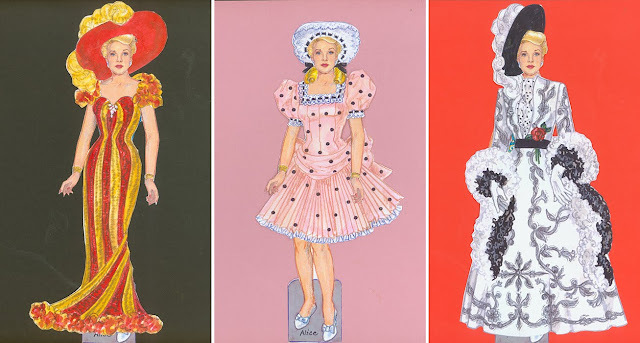 Barbra Streisand’s period pieces from Hello, Dolly! Doris Day’s debut costumes from Romance on the High Seas. Alice Faye’s gay ‘90s gowns from Hello Frisco Hello. 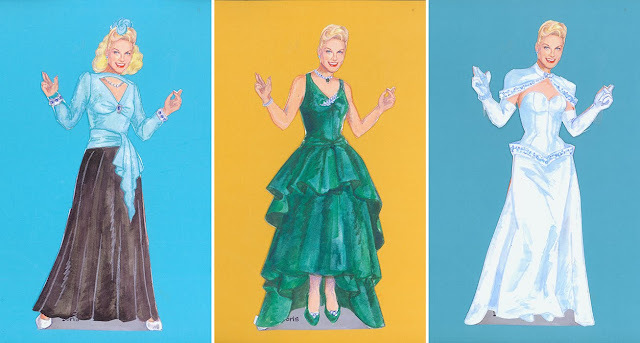 Shirley Jones’ vintage Americana from Oklahoma! Lena Horne’s sultry style from Cabin in the Sky. Seeing the dolls seem to come to life in their finished fashions, cut-out and tabbed into place, is such fun. 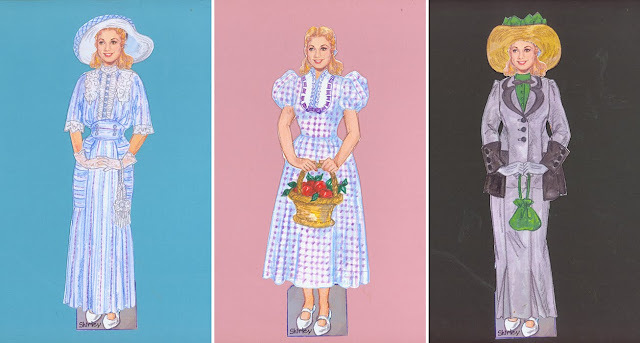 Here are some of the Singing Stars fashion plates. Judy in Easter Parade and A Star is Born. 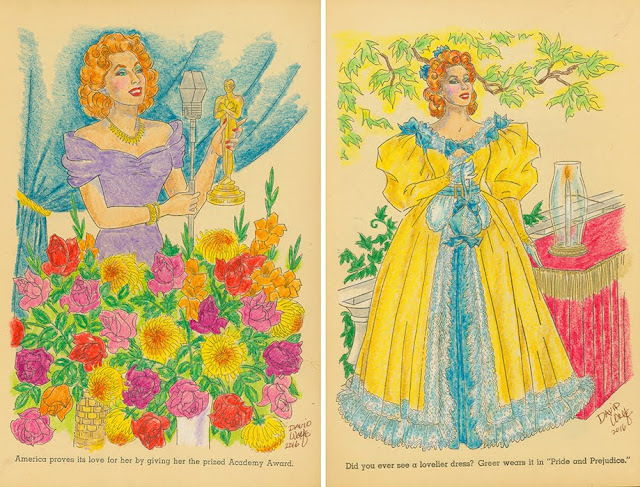 Alice in Lillian Russell and Hello Frisco Hello. 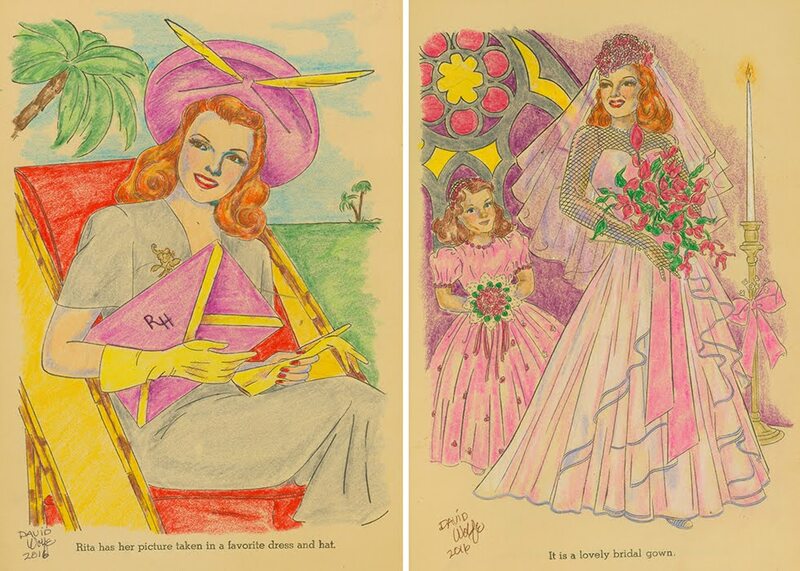 Doris in Romance on the High Seas and Love Me or Leave Me. Lena in ’Til the Clouds Roll By, Broadway Rhythm and Words and Music. Shirley in The Music Man and Oklahoma! 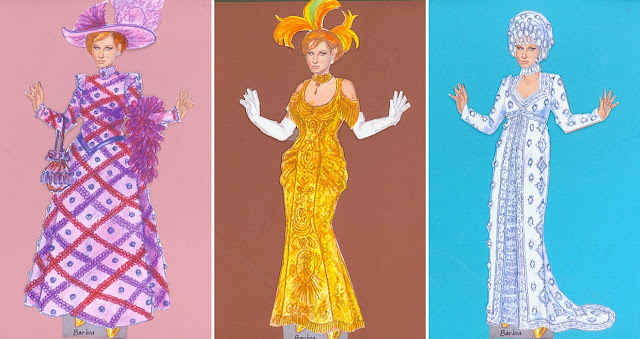 Barbra in Hello Dolly! and On a Clear Day You Can See Forever. 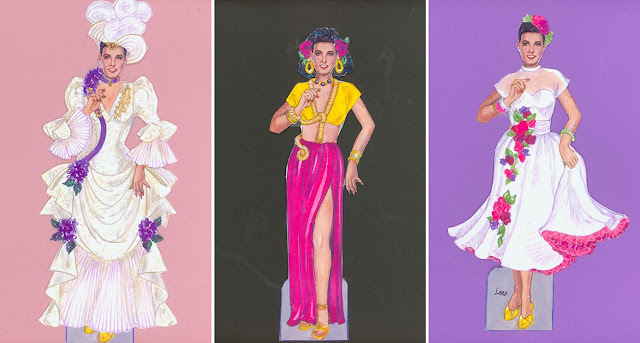 At the recent Phoenix Paper Doll Convention, I did NOT win a prize that I coveted in the raffle, even though I bought plenty of tickets. I was unlucky and did not score a 1944 Greer Garson Coloring Book in mint, un-colored condition. Like all losers, I moaned a bit. Back home a few weeks later, a large box arrived. In it was a Greer Garson Coloring Book AND a 1942 Bette Davis AND two 1942 Rita Hayworth books. 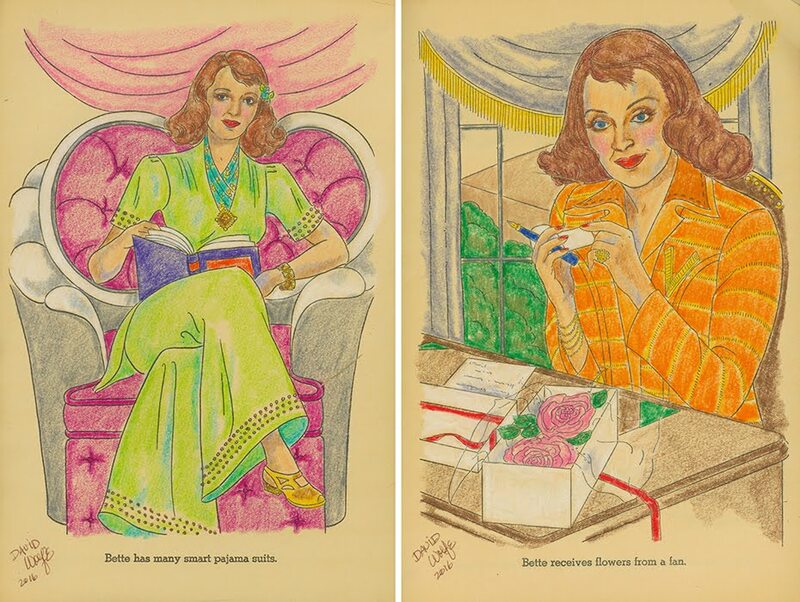 All had a few pages inside that had been crayoned by youngsters just learning how to stay in the lines. I found that absolutely charming and loved the idea of continuing the books’ lifespan by coloring some of the uncolored pages myself. I wondered who had sent the books as there was no return address except e-bay, no note, no card. A few days later, the sender of the surprise confessed. Jenny Taliadoros! What a wonderful friend she is to me! Thank you, Jenny… and I promise to stay in the lines. 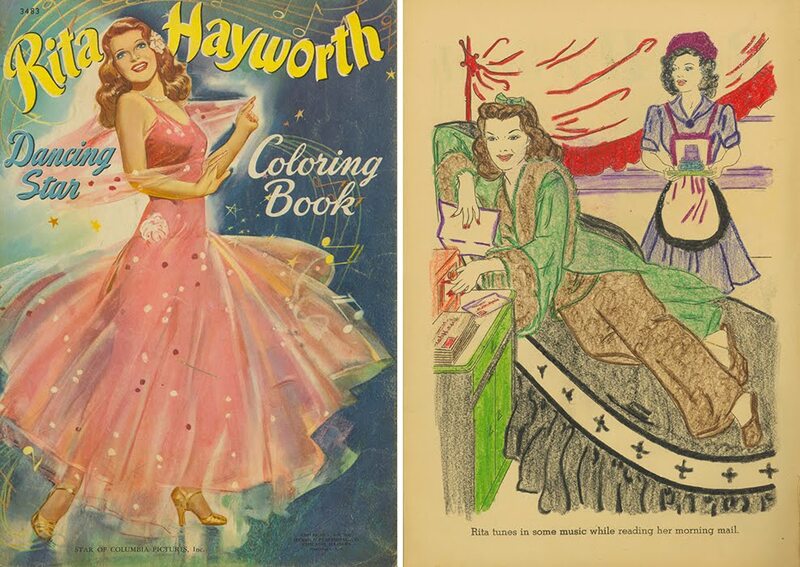 Here is a look at the lavish covers, a page colored by the previous owners long ago and some examples of my own Crayola coloring expertise. Sometimes artwork just doesn’t work. It’s interesting to see how a second attempt, or even a third, will result in obvious improvements. I think of every re-paint as an opportunity to improve, and subsequent attempts are inevitably better than the first version. In Hello Frisco Hello, Alice Faye wears a stunning black and white outfit inspired by the turn-of-the-century; a long white dress trimmed with delicate black lace appliques, accessorized with a sideways cartwheel hat and a black and white feather boa. The applique was a challenge to render, but it was the boa that drove me to distraction. Ostrich feathers are difficult to draw, even more so when half black and half white. I rejected the first version because the feathers looked like long-haired fur and the second reject because the white got too grayed. Finally, on the third try, the ostrich looked frothy and I was happy. Of course, doing three versions meant that I also had to thrice draw those fancy lace appliques…but they got better with each try, too! Reject 1, Reject 2, Third-time lucky. Fashion is always changing because it is a reflection of the ever-changing society that wears it. Fashion right now is undergoing a seismic shift and many of those who follow it simply do not understand what is happening. Most fashion magazines, for example, are totally out of touch. In a recent issue of Elle, the main feature was entitled “Get Real” but it didn’t. 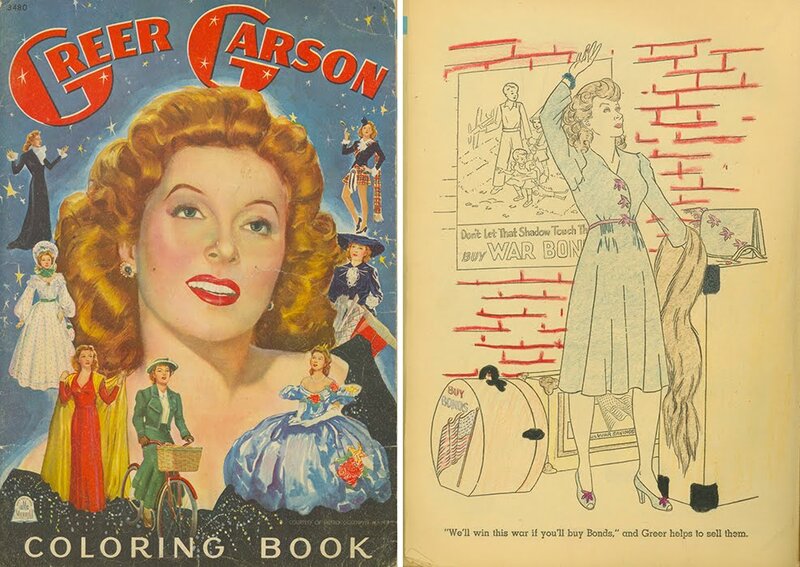 Elle stated, “Far from the catwalk, fall’s greatest hits prove that capital F fashion really does work in the “real” world—yes, even in the burbs,” but in the photos were unreal clothes that will never be seen in any burbs, anywhere. 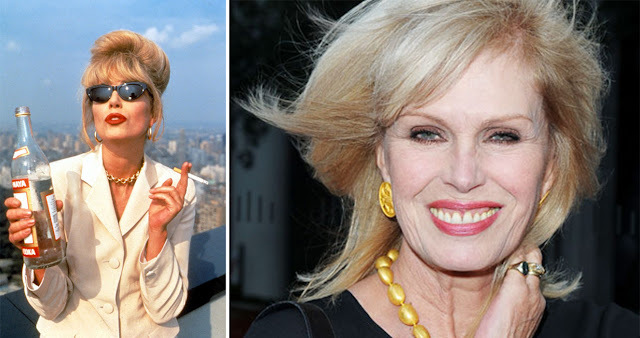 Meanwhile, in an interview promoting the new AbFab movie, actress Joanna Lumley got it right when she said, “There used to be a look in the shoe or the shirt or something that was ‘the look’ and that is kind of gone, and now you have to do it yourself. I think it’s both good and, in a funny way, sad because you will never see someone that looks the height of fashion in the street. You can think they look great but not ‘in fashion’.” Joanna may play a crackpot fashionista, but in real life she understands that fashion today is truly getting real. Elle’s idea of Getting Real is absolutely Unreal. AbFab Actress Joanna Lumley as Patsy Stone and as her real self. The recent semi-annual showing of custom-made creations in Paris clearly demonstrates the collections that once dictated fashion direction for women the world over are now impotent. There are plenty of designers you’ve probably never heard of showing meaningless assortments lacking a style GPS to head them in the right direction instead of any-and-every direction. Only Chanel, Dior and Valentino retain clout, focus and leadership. (However, Chanel’s Karl Lagerfeld is aged, Dior is temporarily without a designer and one of the two co-designers of Valentino is splitting.) Iris Van Herpen possesses true genius and creativity, but her fashion is art, pure art and unlikely to influence wearable apparel. The rest of the couture crowd are spinning their wheels, producing some rather pretty clothes that look too familiar to move fashion forward. Chanel Haute Couture clout for Autumn 2016. Valentino’s Homage to Shakespeare for Autumn 2016. Dior Haute Collection minus a Name Designer. Unwearable Creations by Genius Iris Van Herpen. Autumn ’16 Haute Couture by Armani Prive, Alexandre Vauthier, Elie Saab. Autumn 2016 Haute Couture by Georges Hobeika, Givenchy, Giambattista Valli. Autumn 2016 Haute Couture by J. Mendel, Jean Paul Gaultier, Maison Margiela. Autumn 2016 Haute Couture by Schiaparelli, Versace, Vetements. The recent European designer menswear shows for spring ’17 were more relaxed than ever before. Gone were the neat, natty examples of precision tailoring perfectly polished off with elegant accessories. Sartorial splendor that most real men find an intimidating turn-off has been almost totally replaced with a relaxed, roomy, rather casual look that can conceivably influence mainstream menswear, sooner or later. 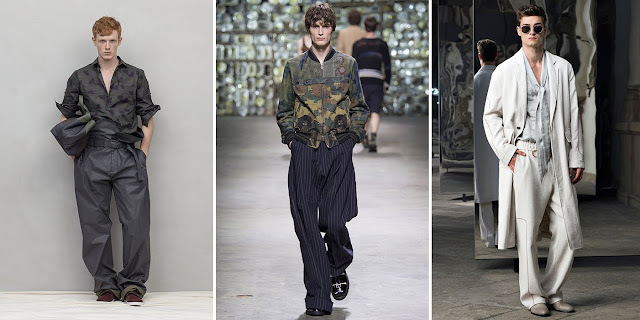 Wider, pleated pants, functional jackets, tracksuits and ‘nary a necktie in sight on the runways of Europe. Dolce & Gabbana, Giorgio Armani, Dior Homme.